Fundraising for the new Picture Butte community pool kicked off last week with a massive boost thanks to a local philanthropist. On Tuesday, Sept. 18, Cor Van Raay, a leading Canadian cattle producer who got his start in the Picture Butte area, donated $1 million towards the construction of the new community pool. 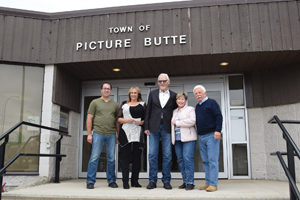 “I’ve been living here for 50 years in the community, and the town of Picture Butte and the surrounding community has always been good to me,” said Van Raay. “I want to give something back to the community. Once the pool is built, Van Raay says he wants to see his grandkids line up at the edge of the pool, and jump in all at once. The donation marks a “great start” to the town’s fundraising efforts for the pool. The town will be holding a major fundraiser sometime in the spring, similar to the one held for the arena ten years ago, to help fundraise the remaining $2.7 million. “We’re asking for people to come forward and help out, and watch your children, watch your grandchildren take the first jump into the brand new pool, that will have all the most awesome features you could possibly think of in there; a waterslide, the spray park features, a beach walk-in entry, three lands to swim in. We will have the picnic tables out there, where your families could come and sit and watch, instead of looking through the chain link fence. We will have one of the most modern swimming pools that is out there, and you won’t have to go to Lethbridge,” said Moore. The donation represents roughly 27 per cent of the cost to build the pool. After hosting a public open house, residents indicated that they would prefer the town to go with the most ambitious one of the three proposed plans for the new pool. Premiere Custom Homes, a local contractor, has been awarded the contract for building the pool and pool house. Premiere will be using Master Pools, who is building the pool in the new ATB Centre in Lethbridge, to construct the new community pool. CAO Keith Davis says they have a “very competent, experienced pool building team”. The work schedule will be confirmed Oct. 2. However, groundwork on the pool house is hoped to begin on the building before the freeze, with work on the pool itself to begin in the spring 2019. Anyone looking to make a donation towards the pool, can contact the town office at 403-732-4555.